Arriving on Sunday, the final day of the 3-day event, Charlotte was immediately captivated by the crowds and cosplayers. 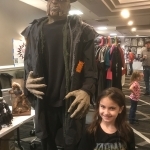 Wearing a Return of the Living Dead Tarman t-shirt from Fright Rags and sporting a Michael Myers mask, she fit in perfectly. 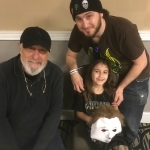 I coaxed her into one of the front rooms where we met the original Michael himself, Nick Castle. Ever the gentlemen, he signed a picture for her, but she would only slide close to him for a photo when I joined in. 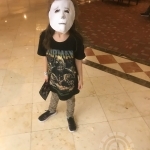 Michael Myers continued to be a running theme of this con, as one particular cosplayer scared her with a mere dark glance on several occasions. A few days before the con, as prep, we watched The Craft, since all four lead actresses would be reuniting for the first time at Monster-Mania. Her favorite part involved Rochelle (Rachel True) being levitated by her fellow witches, a scene Charlotte made me re-enact with her in our living room. 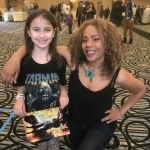 Rachel True was unbelievable to us, making Char so happy in the few minutes we spent meeting her. She even signed our photo, “Light as a feather, stiff as a board” before posing for photos. Luckily for having a young kid at a crowded convention, we had a home base we could stop and relax at. My good friends were vending at the Con, and Charlotte had a blast hanging out with Laurie and Toni of Ghost Girl Greetings. They even named her an honorary Ghost Girl. 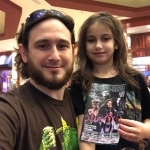 When all was said and done, Charlotte survived her first horror con and is excited to go to more. The operation was a success! 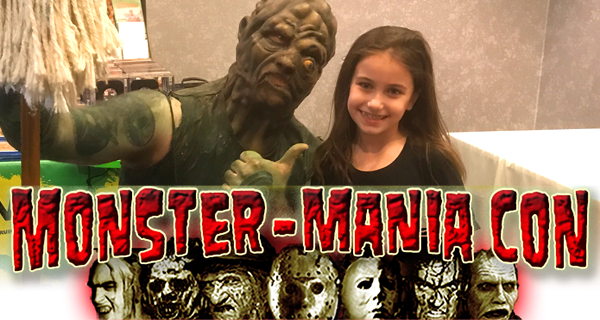 Monster-Mania Con 43 occurs this summer in Cherry Hill, NJ, and already has a packed lineup of guests headlined by author and director Clive Barker and Freddy Krueger himself, Robert Englund. In October, they head to Hunt Valley, Maryland, for Monster-Mania Con 44 highlighted by Bruce Campbell and a Candyman reunion. Check out their website here. 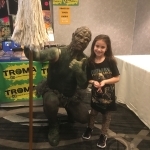 The Ghost Girls will be vending again in two weeks at the New Jersey Horror Con and Film Festival at the Showboat Hotel in Atlantic City. 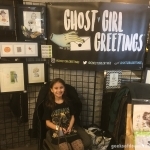 Check out that con’s info here and go to the Ghost Girl’s Etsy store for their whole line of cards and products.